Maiolios Caimbeul, or Myles Campbell, is a Gaelic poet from Staffin on the Isle of Skye. He was born in March 1964, and was schooled only in English. Although he could speak and listen to Gaelic, he did not learn to write in the language until he was 20. After some time in the merchant navy, Caimbeul studied at the University of Edinburgh, and trained to be a Gaelic teacher. He started writing verse in the 1960s, and his first Gaelic poem was published in the magazine Gairm in 1974. Maiolios Caimbeul returned to the Isle of Skye in 1992, and continues to write poetry. He was the Bard at the 2002 Royal National Mod, and won the Wigtown Gaelic Poetry prize in 2008. 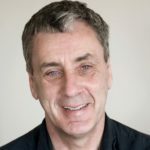 His recent book The Two Sides of the Pass is a collaborative bilingual collection written with Mark O. Goodwin, an English poet living on the island.